The Obamas have not ruled out sending their two daughters to D.C. public schools. It appears public school is still a possibility for President-elect Barack Obama's daughters when they move from Chicago to Washington, D.C., in January. 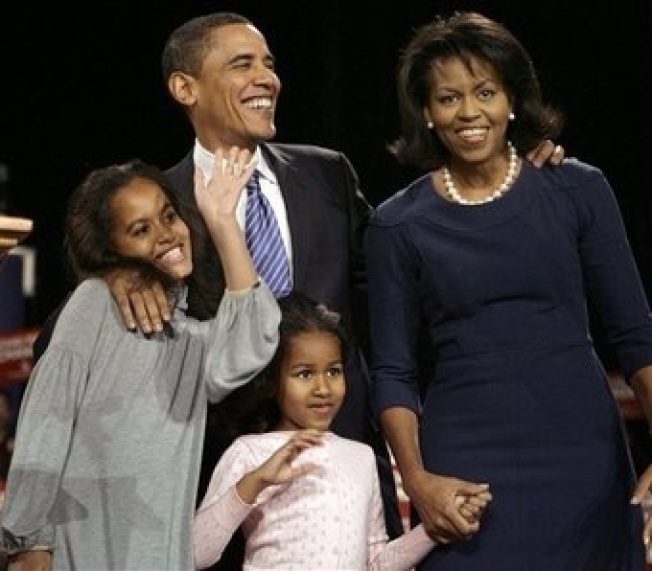 The Obamas have been in discussions with the offices of D.C. Mayor Adrian Fenty and Schools Chancellor Michelle Rhee about possible public schools for their girls, Malia, 10, and Sasha, 7, according to a joint statement from the city officials released on Wednesday. "The Mayor and the Chancellor believe that every parent, including the Obamas, should make the decision on where to send their children to school based solely on what school is in the best interest of the child," the statement said. "We've gladly discussed the many educational options at DCPS, encouraged them to explore all of the alternatives and in the end will fully support whatever decision the Obamas make." It is unclear who has been involved in the talks. The mayor and chancellor's offices did not provide further details, and Obama transition officials have been mum on specifics about the ongoing school search. Michelle Obama toured at least two D.C. private schools on Monday while she and her husband were in town to meet with President Bush and First Lady Laura Bush at the White House. They included Georgetown Day School and Chelsea Clinton's alma mater, Sidwell Friends School. Two of vice president-elect Joe Biden's granddaughters are currently enrolled at Sidwell Friends—perhaps a plus given reports of the kids hotel room slumber parties during the Democratic National Convention. But last week Politico also reported that someone had called Lafayette Elementary School, one of the city's better public schools, inquiring about the process for enrolling two children who at 1600 Pennsylvania Avenue—the White House, which is beyond the school's boundaries. Malia and Sasha, who are in fifth and second grades, currently attend the private University of Chicago Lab School. Carrie Budoff Brown and Cecile Dehesdin contributed to this report.